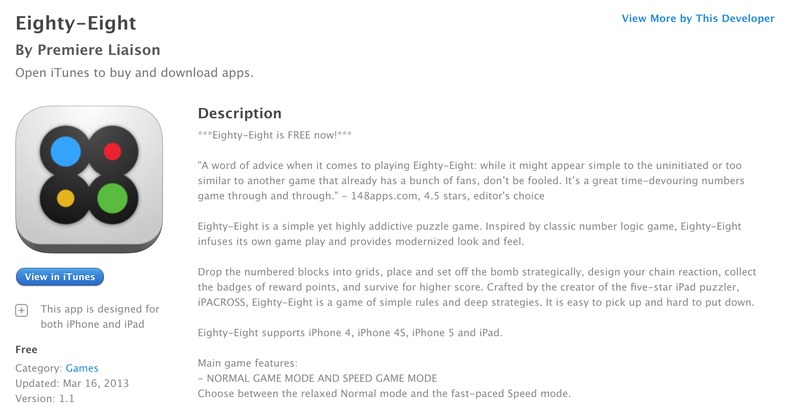 Eighty-Eight for iOS is now available for free. The simple puzzler has been listed between $1 and $2 for the last 3 years or so on the App Store. If you’re into these little addictive puzzlers, you might as well give this one a shot while it’s completely free. It carries 4+ star rating from over 180 gamers and is designed for both iPhone and iPad. Here is the latest App Store Free App of the Week, Osmos is still on sale and all of the rest of your iOS/Mac app deals are in our Games/Apps Guide. Eighty-Eight is a simple yet highly addictive puzzle game. Inspired by classic number logic game, Eighty-Eight infuses its own game play and provides modernized look and feel. Drop the numbered blocks into grids, place and set off the bomb strategically, design your chain reaction, collect the badges of reward points, and survive for higher score. Crafted by the creator of the five-star iPad puzzler, iPACROSS, Eighty-Eight is a game of simple rules and deep strategies. It is easy to pick up and hard to put down. Eighty-Eight supports iPhone 4, iPhone 4S, iPhone 5 and iPad. Main game features: – NORMAL GAME MODE AND SPEED GAME MODE Choose between the relaxed Normal mode and the fast-paced Speed mode. – UNIQUE BADGE SYSTEM 20 badges with varied winning conditions can be won during the game. Aside from designing your chain reaction, badge is also critical to a new high-score. – GAME STATISTICS The game keeps record of your past achievements and play scores. Horn your skills and aim for better. – GAME CENTER SUPPORT Earn your Game Center points by winning in-game badges. Compare your scores with your friends and global players, compete for higher position on the global Game Center leaderboards.